This post about British Soccer Camp is one such post. What does Evan want to be when he grows up? A soccer player. That’s why I’m not at all surprised when he was full of delight when I asked him if he’d be interested in spending a week of his summer focused on soccer skills. I didn’t even have to bribe him with “you’ll get to ride to work with Mommy and maybe we’ll stop for coffee one or two days”, because he’s just that into soccer. Score. We’re lucky here in Pittsburgh to have several options for the soccer camp in the area this summer, with locations around the city that are sure to be convenient for all of us ‘Burghers. 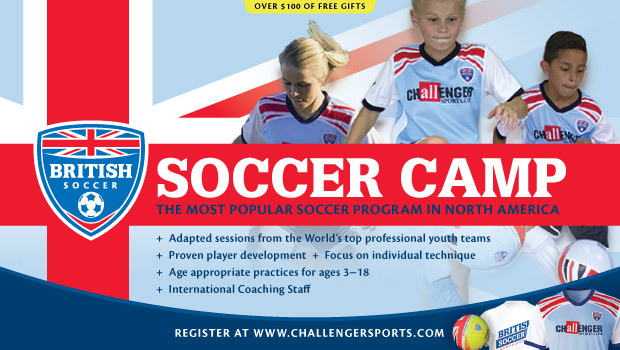 If your soccer player isn’t ready to take on a full day program, there are also half-day options available.